Wyoming is known for having wide-open spaces and plenty of wind. Artist Tim Cox of Bloomfield, New Mexico, has felt the abrasive gusts as they sweep across the mountains and into the picturesque valleys at Wagonhound Land & Livestock Co. in Douglas. Cowboy Artists of America honorary member Art Nicholas owns the ranch. The outfit’s horses, landscape, cottony clouds and wind were muses for Cox’s painting Summer Breezes, which is one of his wife Suzie’s favorites. Cox created the painting for the CAA Exhibition & Sale in 2008, his first year as a member. 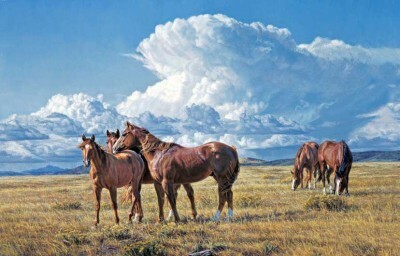 As with all of his paintings, Summer Breezes Tim Cox conveys the calm before the storm on Wyoming’s Wagonhound Land & Livestock Co. By Jennifer Denison Cox used a compilation of photographs he had taken on ranches, as well as his imagination, to create a painting that showed the connection among horses, ranching, the landscape and the weather. “I wanted to show a summer afternoon pastoral scene where everything is relaxed, and a person wouldn’t mind ‘stepping into’ the painting and feeling the breeze,” he says. Cox achieved his goal. The blowing manes and tails on the horses, along with the feathering storm clouds overhead, create a windswept scene that is so realistic that viewers can’t help but hear the howl of the wind. In this painting, he positioned the horses at angles that move a viewer’s eye around the canvas. If you follow the neck of the sorrel horse standing horizontally on the left, it guides you along the horse’s back, over its hip and down its leg to the shadow. Then the eye goes to the bush and up the bay horse’s neck on the right of the painting and into the sky, Cox explains. The contrast of light and dark in the clouds moves the eye into the backdrop, where Laramie Peak is seen at the left of the painting. An avid horseman, Cox has an eye for horseflesh and conveys it in the detail and accuracy of the horses he paints. Naturally, he would be drawn to the high-quality ranch horses raised on the Wagonhound for his paintings and to ride. The artist has two colts sired by the Wagonhound’s leading cutting horse stallion, WR This Cats Smart, by High Brow Cat and out of The Smart Look by Smart Little Lena. One is a 3-year-old named Catimus Maximus, who is in training and will be shown in cutting horse derbies this year. The other is a yearling cutting horse prospect named Grumpy Cat that Cox’s daughter, Calla, will start as a 2-year-old this spring. For more information on Cox, visit timcox.com.